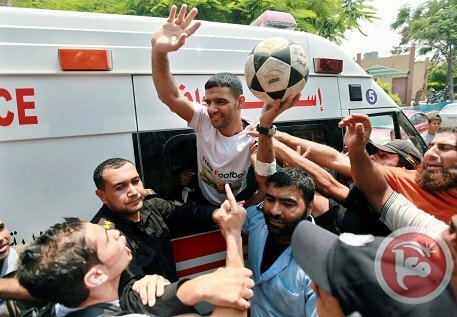 Tuesday July 10 – Campaigners welcomed news of the release of Palestinian footballer Mahmoud Sarsak after three years in an Israeli jail, but vowed to continue working for an end to the system of detention under which he and hundreds of others have been detained without charge or trial. Twenty-five year old Sarsak lost a third of his body weight during a three month hunger strike in protest at his incarceration since July 2009 under Israel’s ‘Unlawful Combatants Law’, which is illegal under international law. The Israeli authorities agreed on June 18 that his detention should end following an international outcry. Footballing legend Eric Cantona and French international star Frederic Kanoute , FIFA President Sepp Blatter and the international federation of professional footballers FIFPro joined forces with filmmaker Ken Loach, Archbishop Desmond Tutu, author Alice Walker and many others demanding an end to his unjust detention. Relatives gathered at the Palestinian side of the Israeli Erez crossing in northern Gaza on Tuesday to welcome the freed prisoner who was then transferred to Shifa hospital in Gaza City for medical attention. “I thank God and all the athletes of the world,” Sarsak told Reuters between sips from a bottle of water. FIFPro, the international federation of professional footballers, welcomed Sarsak’s release but made clear that no other Palestinian footballers should have to go through what he had experienced. ‘We, FIFPro, refer to the fact that all professional footballers in the world must have equal rights, including the right to freedom of movement, which is a universal right of every citizen. That also applies to all professional footballers in and from Palestine.’ said FIFPro secretary general Theo van Seggelen. While Sarsak was still on hunger strike in June the president of the Palestinian Football Association, Jabril Rajoub, wrote to UEFA president Michel Platini reminding him that Olympic squad goalkeeper Omar Abu Rois and Ramallah player Mohammed Nimr are also being held by Israel without charge. “For athletes in Palestine, there is no real freedom of movement and the risks of being detained or even killed are always looming before their eyes,” Rajoub said. Rajoub’s request reiterated a plea sent to Platini a year earlier by 42 Palestinian football clubs based in Gaza, the besieged Palestinian territory close to the Egyptian border which is home to many of Palestine’s best players. Platini ignored the appeal from the clubs and rejected Rajoub’s. 6. Red Card Israeli Apartheid petition and letter outlining the case against Israel’s hosting UEFA’s 2013 Under-21 finals. Full text and signatory list of June 12 letter. 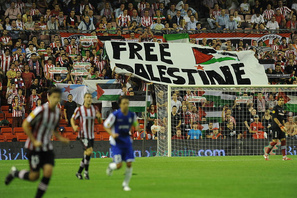 – July 2011 Palestinian players were prevented from entering the West Bank fromJordan after an away game in Thailand. Mohammed Samara and right back Majed Abusidu therefore missed the return game at home 5 days later. – In 2010 the football league winners of Gaza and West Bank had to postpone their cup final because the Gazan team was refused permission to travel. – In May 2008 the national team was not able to attend the AFC Challenge Cup, denying them qualification for the 2011 Asia Cup. – In April 2006, Israeli missiles destroyed Gaza’s only football stadium. 14. At least two of four U21 Championship venues are on or adjacent to land seized from Palestinians. a) Bloomfield – before Israeli forces occupied Jaffa in 1948, the ground was known as Basa (swamp) Stadium, home to local Jaffa team Shabab el-Arab. They were expelled and later formed Shabab el-Nassera in Nazareth. In January 1949 the Basa stadium was given to the Hapoel Tel Aviv team by the Israeli “custodian of absentee property”. 15. Palestinian child footballers, victims of Israeli military actions. – October 2004: Jihad Hassan Barhoum, 16, was shot in the abdomen by Israeli troops in October 2004. A seven-year old was hit in the back. – 2001: Khalil al-Mughrabi, 11, was hit in the head by a burst of gunfire. Two friends, aged 10 and 12, were wounded. It’s good to know that Britain’s political leaders care so deeply “about the rule of law and selective justice” in Ukraine, that government ministers declined to attend the England football team’s quarter final Euro 2012 match there on Sunday (June 24). 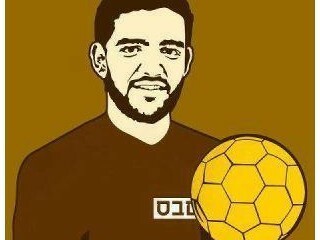 Strange, then, that the illegal and unjust treatment of Palestinian footballer Mahmoud Sarsak – whose family is waiting anxiously to see if Israel will stand by a promise to release him after three months on hunger strike and three years in prison without charge or trial – elicits no such concern from the British government. Nor, even more shamefully, from UEFA, which has reaffirmed its decision to let Israel host next year’s under-21 competition. Palestinian FA president Jibril Rajoub wrote to UEFA president Michel Platini pleading with him to withdraw the U-21 from Israel. He said that in addition to Sarsak, Israel was detaining two more footballers, Olympic squad goalkeeper Omar Abu Rois and Ramallah player Mohammed Nimr, and that Palestinian athletes lack freedom of movement and face the constant risk “of being detained or even killed”. Platini acknowledged that UEFA had come under “a certain amount of pressure” but he ignored the points Rajoub made and reprimanded him for allowing the content of his letter to enter the public domain. The contempt for Palestine and its footballers exhibited by the man in charge of European football’s governing body is breathtaking. Platini must not be allowed to get away with peddling the idea that sport can be regarded as “apolitical” in a state which wantonly prevents Palestinian footballers from training and playing, brands them terrorists and imprisons them at will. More than 300 Palestinians are held without charge or trial along with more than 4000 other political prisoners, all detained illegally in Israeli prisons. Akram Rikhawi has been on hunger strike for more than 70 days in protest at his detention and Hassan Safadi, who ended a 71 day hunger strike on 14 May, has resumed his fast after Israel breached a deal to free him. 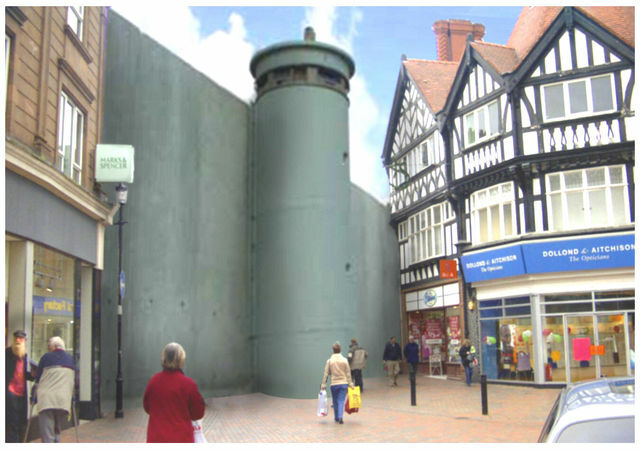 And yet Platini suggests that the state responsible for this could hold a “beautiful celebration” that will “bring people together”. Fortunately these bankrupt arguments don’t wash with many of those responsible for the pressure to which Platini referred. These include French footballing legend Eric Cantona, Archbishop Desmond Tutu, filmmaker Ken Loach and others who called for an end to Israel’s impunity in a letter to Platini on June 12. They questioned why Ukraine was challenged (rightly) over its human rights record while Israel was not. “Racism, human rights abuses and gross violations of international law are daily occurrences in that country,” their letter said. The campaign to free Sarsak has brought the plight of Palestinians to world attention, with support from the international federation of professional footballers FIFpro, 20 French players include Frederic Kanoute, Nicolas Anelka and Abou Diaby, the UK Professional Footballers’ Association, and even Sepp Blatter, the president of the international federation of football associations, FIFA. See previous post for a summary. British comedian Mark Steel lampooned the Israeli position in the Independent newspaper. “In 2006, [the Palestinian national team] were top of their World Cup qualifying group when the entire team was refused a visa for their match with Uzbekistan,” Steel wrote. An Israeli Embassy functionary alleged in response that Sarsak was a terrorist and that calling him a “young Palestinian footballer” was “insulting to footballers”. The campaign to strip Israel of the under 21 competition has generated increasingly creative forms of protest. About 140 protesters in Scotland added to the 8-0 humiliation of the Israeli national women’s team in a European championship qualifying match on June 17 with a large, energetic demonstration in the stands. “Free Mahmoud Sarsak” was interspersed throughout ninety minutes of non-stop chanting with “Without guns, you’re rubbish” and multiple versions of “Boycott apartheid Israel”. 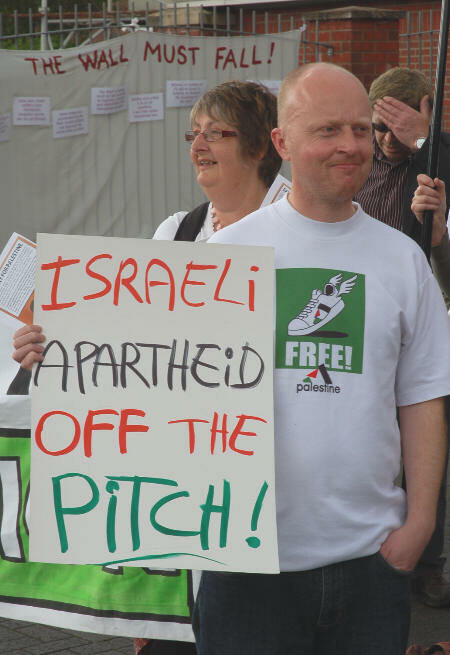 The protestors warned the Scottish players of Israel’s habit of calling in an air strike when losing in a fair fight. Mainstream sports reports couldn’t ignore the protests. 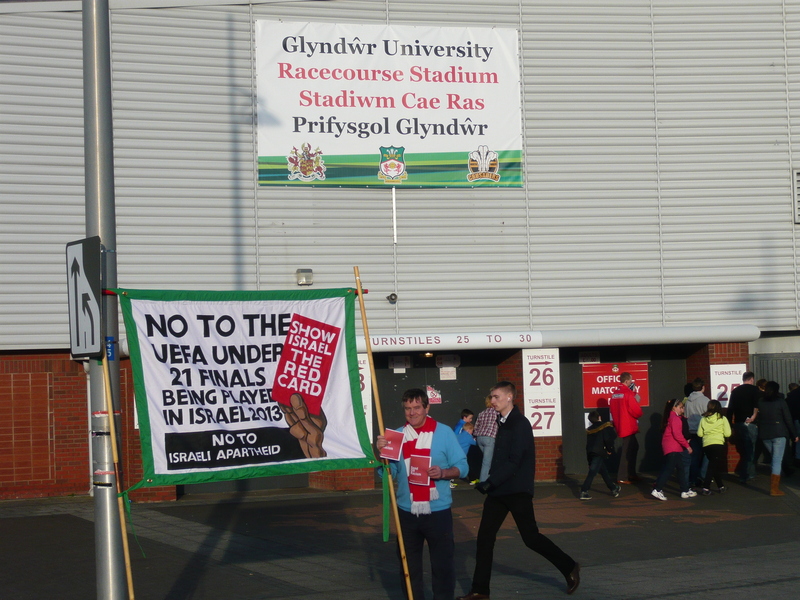 Red Card Israeli Apartheid banner at the Welsh demonstration on June 20. 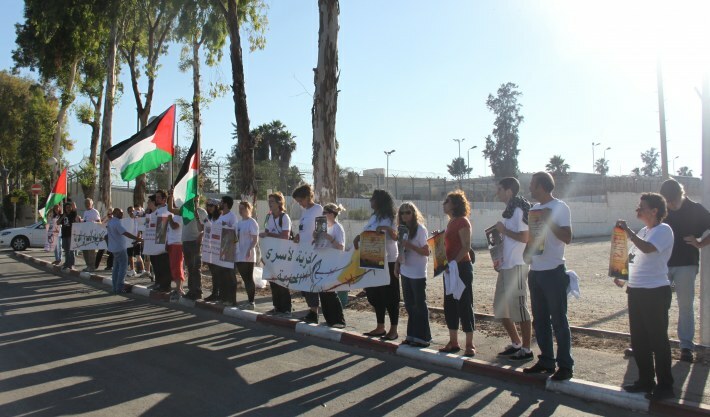 At a similar fixture in Wales three days later, around 50 activists picketed the main entrance and several were thrown out of the football ground for wearing Palestinian team shirts, holding Palestinian flags or just for chanting Free Palestine. The head of security told campaigners he had orders from UEFA to remove any signs of support for the Palestinian people from the stadium. 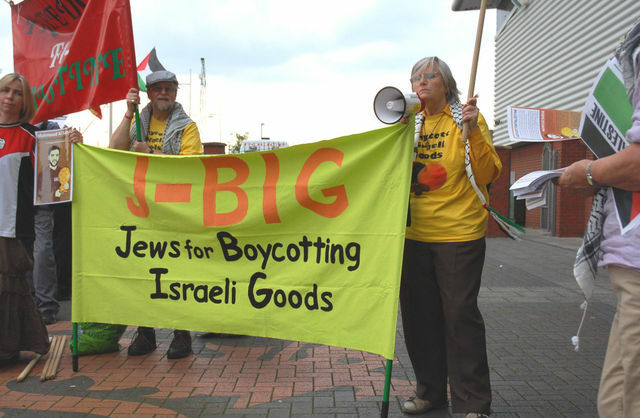 J-BIG supporters joined the Red Card Israeli Apartheid picket in Wales. A report made it into the Israeli media. The Zionist Jewish Chronicle covered the football story in some detail. While an Israeli judicial committee weighs the life of footballer Mahmoud Sarsak in the balance, European football’s governing body is busy demonstrating the bankruptcy of the idea that sport has nothing to do with politics. Replying by email to journalists who inquired on Friday about the Palestinian call for Israel to be stripped of hosting the under-21 championships next year, UEFA’s media services department said the organisation was “of the opinion that football – and sport in general – are building bridges between nations and communities and that political matters should not interfere with the practice of the game. In other words, despite international outcry at the unlawful detention without charge or trial of Sarsak and other Palestinian footballers, among 4000+ other political prisoners held in Israeli jails, UEFA rewards the state which perpetrates these outrages. The Palestinian Football Association, previously wary of angering the Israel authorities on which it depends for facilities to bring a Palestinian team to the London Olympics, specifically called on UEFA to dismiss Israel as youth championship host. “We ask your excellency not to give Israel the honour of hosting the next UEFA U21 Championship in 2013,” PFA President Jibril Rajoub said in a letter to UEFA president Michel Platini. “For athletes in Palestine, there is no real freedom of movement and the risks of being detained or even killed are always looming before their eyes,” Rajoub wrote, noting that in addition to Sarsak, Olympic squad goalkeeper Omar Abu Rois and Ramallah player Mohammed Nimr were also being held by Israel without charge. The Jerusalem Post put its own spin on the story, accusing the Palestinian Authority of politicising the situation and demonstrating how vital the 2013 U-21 games are to Israel’s attempts to sanitise its tainted image. UEFA should understand that the only “bridges” built by its complicity with Israeli propaganda are the Jewish-only roads that link the illegal settlements in the occupied West Bank to the institutionally racist state. Sport cannot build bridges when one community wields state power to imprison and oppress another. The idea that politics can be separated from sport in this situation is clearly untenable. The UEFA media statement rings particularly hollow given Platini’s refusal even to acknowledge an appeal a year ago from 42 Palestinian football clubs in Gaza calling on the organisation not to reward Israel for its racism and illegality. On Friday (June 15), the Red Card Israeli Apartheid campaign reminded UK Sports Minister Hugh Robertson of this, handing in a letter summarising the burgeoning support for the Palestinian footballers. The campaign urged Robertson to act upon an earlier letter to him and Platini, signed by eminent figures including former football legend Éric Cantona, filmmaker Ken Loach, Michael Mansfield, QC, Archbishop Desmond Tutu and writer Alice Walker. They had addressed racist oppression in Israel as exemplified by the treatment of Sarsak and called for an end to Israel’s impunity. By rejecting calls from Palestinians and their supporters, UEFA is actively encouraging the state of Israel to continue perpetrating human rights abuses and defying international law. In this it is only following the example of Israel’s allies among the major colonial powers, especially the United States. In the face of such hypocrisy and injustice, activists in many countries have been inspired to hold protests at sports ministries and Israeli embassies and in Scotland, at Tynecastle Stadium, where Israel’s national women’s team went down to an 8-0 defeat on Saturday in a women’s Euro qualifier. The petition for Sarsak’s release is building signatures, though many more are needed. All this has started, at last, to gain some exposure in UK and international media, allbeit considerably less than would be the case if the imprisoned sportsmen were anyone other than Palestinians held in Israel. Thousands of football supporters at three UK grounds heard the message “Show Israel the Red Card” on Wednesday February 22, when campaigners handed out leaflets at UEFA under-21 matches at Middlesborough, Wrexham and Paisley. Their call for Europe’s football governing body to withdraw the under-21 finals from Israel in 2013 attracted friendly attention from fans. At Wrexham, a banner proclaimed the message “No to Israeli apartheid” and campaigners raised the cry: “Change the finals toWales”. As part of the run-up to UEFA’s Annual Open Congress, due to be held in Istanbul on March 22, leaflets were delivered for Welsh manager Brian Flynn and the head of the Welsh Football Association Phil Pritchard. “The Palestinian people are treated worse than black people were during South African apartheid or in the segregated southern states ofAmerica,” the leaflets said. “We are urging all the European football associations to support the 42 Palestinian clubs in the Gaza Strip who have called on UEFA President Michel Platini not to reward Israel for its racist discrimination against Palestinians,” said Geoff Lee, UK coordinator of Red Card Israeli Apartheid. In Middlesborough the campaign team included members of the Northumberland County UNISON trade union branch. Leaflets were snapped up by receptive fans, said Mick Bowman of Newcastle Palestine Solidarity Campaign. 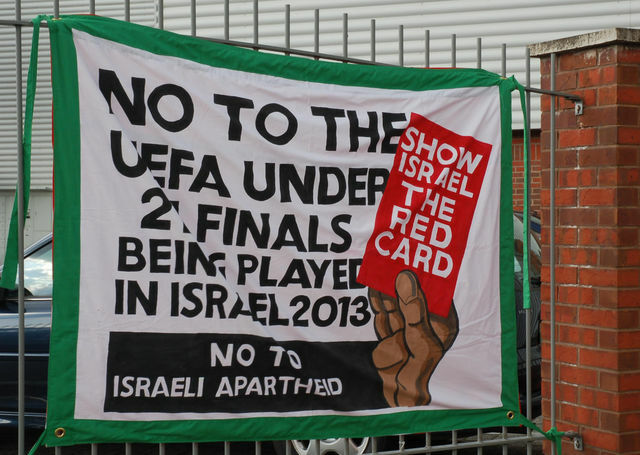 The Red Card Israeli Apartheid campaign began a year ago, after UEFA announced its decision to award Israel the 2013 under-21 finals. 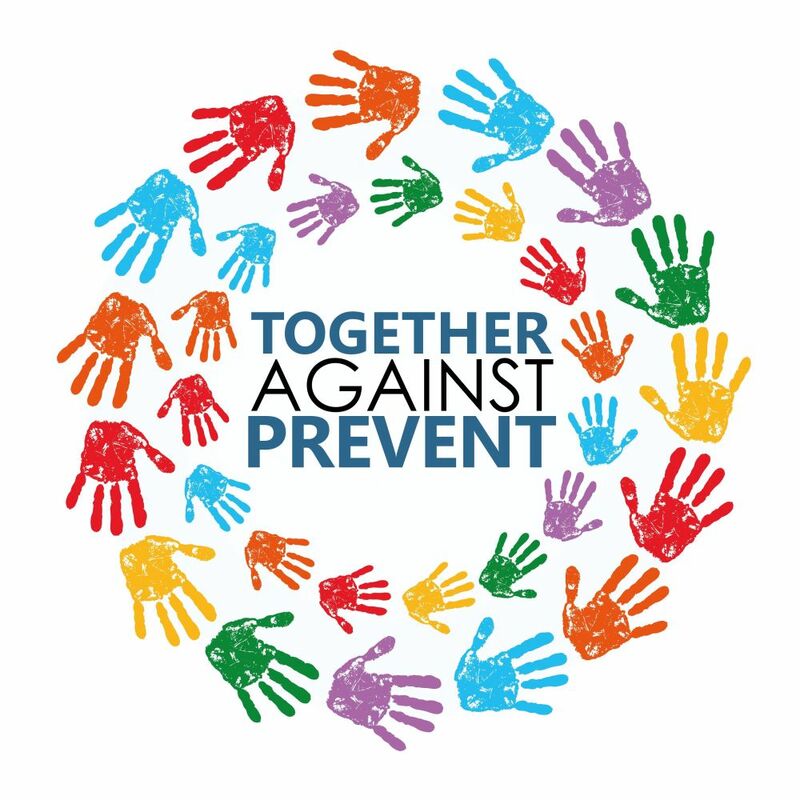 See here for a report on campaign action to date.